Located beneath the cliffs of the Manyara Escarpment, on the edge of the Rift Valley, Lake Manyara National Park offers varied ecosystems, incredible bird life, and breathtaking views.Lake Manyara’s famous tree-climbing lions are another reason to pay this park a visit. The only kind of their species in the world, they make the ancient mahogany and elegant acacias their home during the rainy season, and are a well-known but rather rare feature of the northern park. In addition to the lions, the national park is also home to the largest concentration of baboons anywhere in the world — a fact that makes for interesting game viewing of large families of the primates. Morning game viewing drives then return to the lodge for breakfast , proceed further game drives as you exit the park and drive to Ngorongoro conservation area via Olduvai gorge – Proceed for dinner and overnight stay at Ngorongoro Sopa Lodge. After breakfast you will be taken 2000ft down the crater by a 4wheel drive vehicle for a full day crater tour, picnic lunch at crater. Explore the crater before ascending back to the Ngorongoro Sopa Lodge for dinner and overnight. 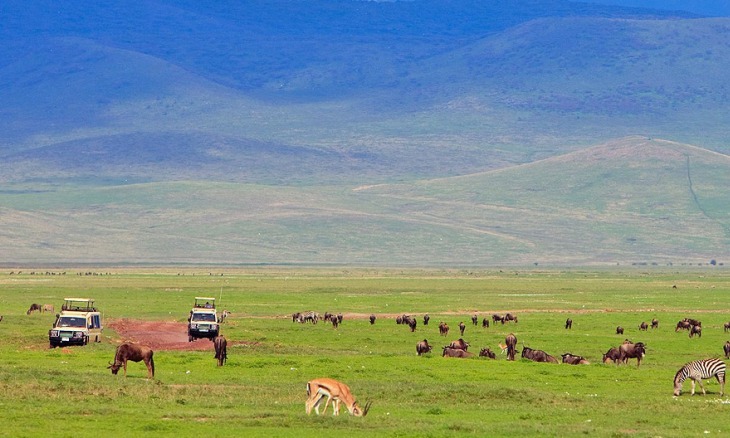 The Ngorongoro Crater is often called ‘Africa’s Eden’ and the ‘8th Natural Wonder of the World,’ a visit to the crater is a main drawcard for tourists coming to Tanzania and a definite world-class attraction. The Ngorongoro Conservation Area (NCA) is home of Ngorongoro Crater. It was formed some 2.5 million years ago from a volcanic mountain sinking due to inactivity, and was initially thought to be higher than Tanzania’s famous Kilimanjaro.